A dash-cam video (below) posted by Hans Noordsij from the Netherlands erupted on Twitter that shows Tesla’s Autopilot system alarming the driver just before the accident happens infront. This forward collision warning might first seem to be out of nowhere but a second later the mystery is solved. According to the driver of Tesla the vehicle did not just alarmed him of a possible collision but also started to apply Automatic Emergency Brakes. Off-course the driver then applied further braking and Tesla occupants stopped at a safe distance. Another good news is that the people involved in the accident are also safe. So how did Tesla Autopilot managed to predict the accident? The answer lies in 8.0 Autopilot software update which enables the on-board radar to detect a vehicle beyond the one you have in-front. Before 8.0 Tesla vehicles equipped with a radar could only detect one vehicle at the front. As we can compare the front vehicle detection by the radar from the pictures below for Autopilot 8.0 and 7.0 they can detect 2 and 1 vehicle respectively. Click/Tap images to zoom-in, share or download. 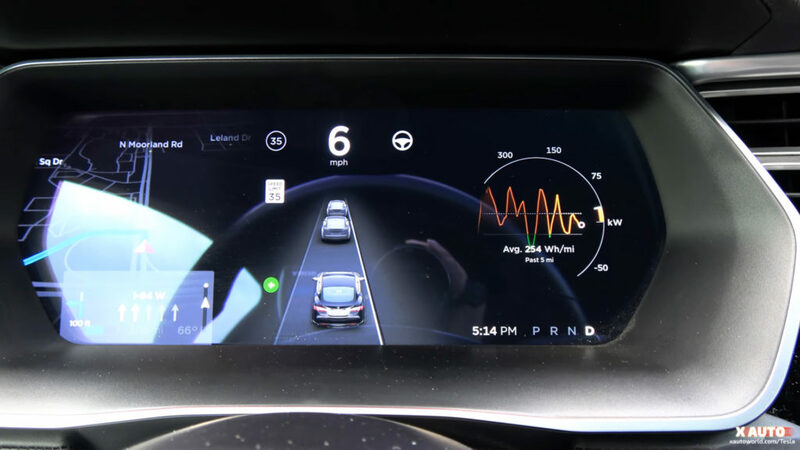 What 8.0 update to Autopilot software on Tesla vehicles enables the radar to leap under or from sides of the vehicle in front to detect the 2nd vehicle in the row. 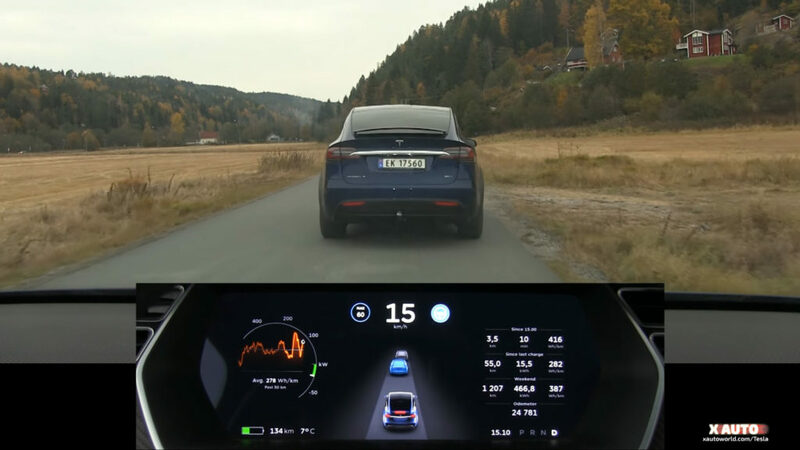 The famous guy in Tesla community Mr. Bjørn Nyland performed the test on the new update and improvement in the radar tech in the following video. This is so far the best testing video of this system and closely resembles to the highway accident prediction we saw earlier. This update was performed directly over-the-air for Autopilot 1.0 hardware but is still not deployed to Autopilot 2.0 cars. This is basically due to the fact that Autopilot 2.0 hardware equipped Tesla vehicles will for some time have less features than Autopilot 1.0 cars as stated by Elon Musk in his Autopilot 2.0 press conference. As the system confidence level rises, the braking force will gradually increase to full strength when it is approximately 99.99% certain of a collision. According to Tesla their vehicle radar system can effectively detect even a landing UFO in zero visibility conditions, this and more you can read from Tesla’s press-release about their radar system, it’s efficiency and how it will improve over time. After careful consideration, we now believe it can be used as a primary control sensor without requiring the camera to confirm visual image recognition. This is a non-trivial and counter-intuitive problem, because of how strange the world looks in radar. Photons of that wavelength travel easily through fog, dust, rain and snow, but anything metallic looks like a mirror. The radar can see people, but they appear partially translucent. Something made of wood or painted plastic, though opaque to a person, is almost as transparent as glass to radar.